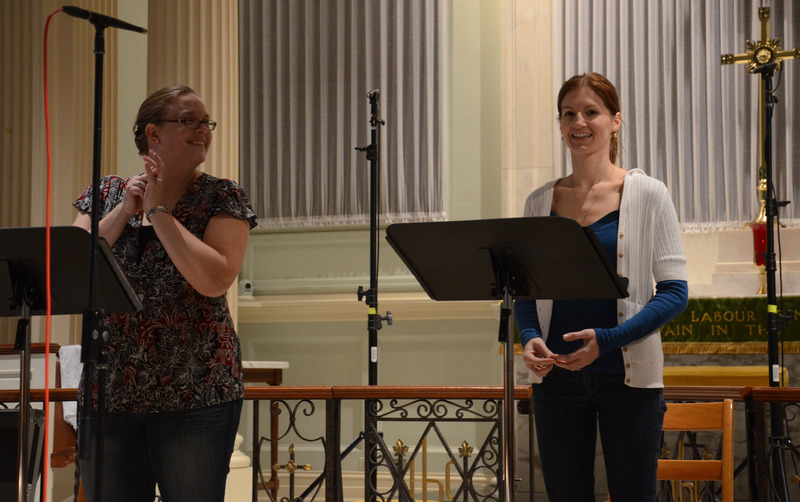 As you may recall, Armonia Celeste recorded its second CD last fall. 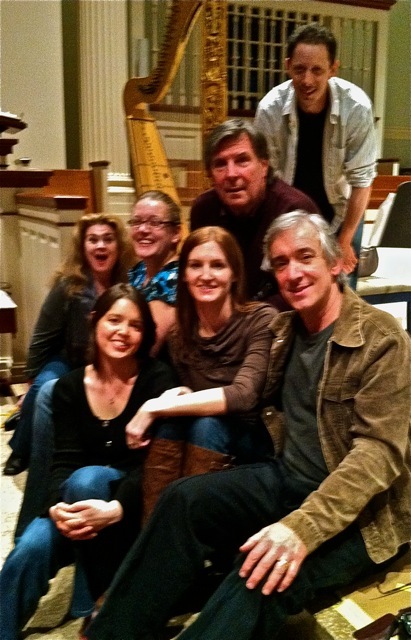 Sarah, Dianna, Rebecca, Lyle, and Paula convened in Silver Spring, Maryland, to make the recording. An all-star cast was brought in to help: UK-based producer Malcolm Bruno oversaw the festivities, and guest artists Cynthia Roberts and Madeline Adkins on baroque violin and Allen Whear on baroque cello supplied bowed-string color (and brilliant panache) on a couple of the selections. Armonia Celeste needs your help to raise $6000 by August 2 in order to finish this historically and musicologically important recording and release it to the public. And what wonderful music comprises this CD? 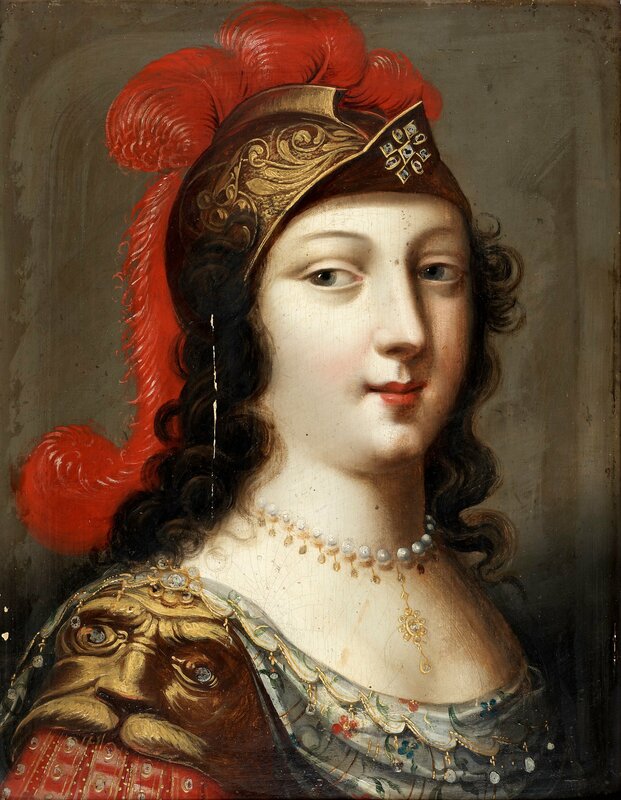 Music from the chapels and courts of Queen Christina of Sweden (1626-1689), who was enamored of Italian musical, religious, and political culture–so much so that she abdicated the Swedish throne and moved to Rome to set up court, where she patronized the finest composers and performers of her time. Armonia Celeste’s The Rebel Queen features haunting sacred and stirring secular music from such musical lights of the era as Mazzocchi, Rossi, Carissimi, Pasquini, and the harpist-singer Marazzoli, exquisitely sung with the ensemble’s signature blend, and accompanied with verve and style on period instruments. 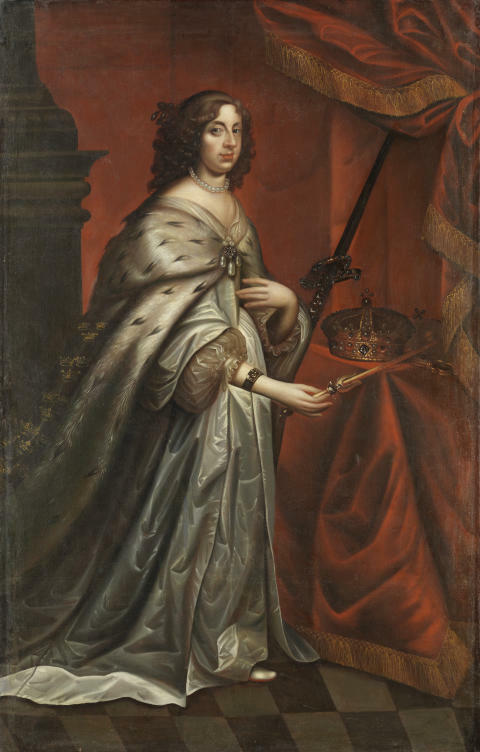 By all accounts, Queen Christina of Sweden was a strong-willed, mischief-making, and rule-breaking woman. Her shocking exploits included cutting her hair short, wearing men’s clothing, and chatting flippantly with common merchants and beggars. We delve more into her mold-breaking character and remarkable life here and in the video below. You’ll also hear a preview track from the album: La Corista by Lelio Colista, featuring our guest artists on bowed strings and Lyle and Paula on plucked-string continuo (theorbo and baroque triple harp). Have a look and a listen to the delights that await you and the 21st-century audience if Armonia Celeste succeeds (with your help) in bringing this recording to the public! As always…many thanks for your support. There are major differences in recording an album versus performing the same program live. The amount of focus, stamina, and energy needed to capture everything on recording (which is, let’s face it, FOREVER) is really hard to sustain. The only way to deal with it is to just do it…hopefully more than once! That was my attitude going into recording The Rebel Queen album with Armonia Celeste this month. I was looking forward to the recording process now that we had already been through it together as a group for the Udite Amanti album. We made it through that experience with flying colors, and I was eager to see what would happen this time. Well, what happened is even more polished, expressive, and (if I do say so myself) impressive singing and playing than even I was anticipating. I am constantly humbled and honored working with such fantastic musicians! The music on The Rebel Queen is extremely special. Every piece is very personal to the members of the group, and we have spent a long time honing the repertoire and narrowing it down to the strongest, most varied, and most moving pieces. One of my personal favorites on the album is “Memento homo. Anima peccatrice” by Marazzoli. This is a piece that is full of chromatic, almost shocking harmonies—things like unresolved suspensions just hanging in midair, cluster chords between the three voices for whole measures at a time, odd dissonances and cross relations–as well as rangy, dramatic solos, all serving the purpose of portraying the text, which is a fervent plea for sinful man to repent and be transformed by God. 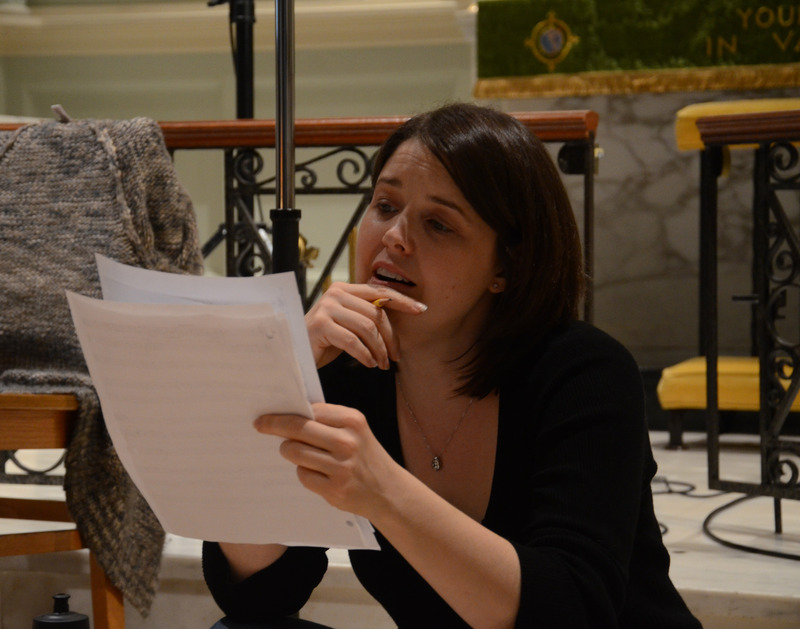 Other favorite pieces on this album include Sarah’s exciting and flashy piece entitled “Sdegno” (Disdain!) by Rossi, Rebecca’s dramatic “Circondata di mali” from the opera La vita humana by Marazzoli, and the hauntingly beautiful “Benedictus Deus” by Carissimi featuring the complete ensemble. Two concerts this weekend in Maryland! Armonia Celeste reprises their popular program “Udite Amanti–Lovers, Beware! 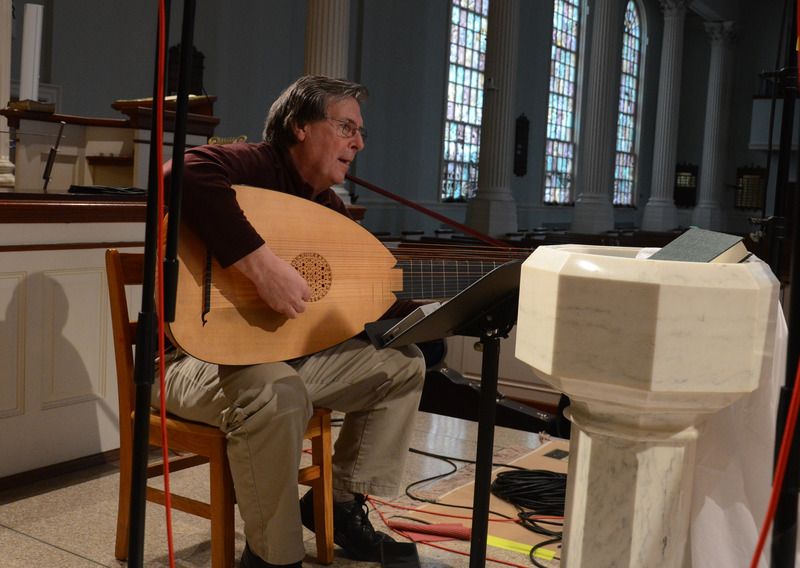 Music from the 17th-Century Barberini Court” on the Penn Alps concert series in the Western Maryland mountains, and at An Die Musik in Baltimore. The music is a luscious selection from composers active at the Barberini court, which the ensemble recently recorded (expect the CD in late 2012 or early ’13), featuring gorgeous vocal solos, duets, and trios along with toe-tapping instrumental selections. Come see why audiences around the country consistently receive this program with an enthusiastic standing ovation–and be sure to stop by after the concert to meet the ensemble! Saturday, June 9, 2012 – 7:30 p.m.
Sunday, June 10, 2012 – 5:00 p.m.
First edits back from our new CD! We are very excited at having received the first edits back from our January recording session of our upcoming CD, tentatively entitled “Udite Amanti–Lovers, Beware! : Music from the Seventeenth-Century Barberini Court.” You can read more specifics about the repertoire and composers on this CD in recent blog posts, but in brief this looks like shaping up to be an enchanting mix of instrumental solos and duets punctuating sung trios, duets, and solos all accompanied by various combinations of lute, theorbo, baroque guitar, and baroque triple (Barberini!) harp. The music is alternatively flirtatious, plaintive, lush, and ethereal, with our producer and recording engineer having gotten a very rich sound out of our palette of three voices and historical plucked strings. It is a sound that promises to take you back nearly 400 years, immersing you in a world of intrigue, privilege, and passion. We are currently preparing some clips to post on our website to give you a sneak preview of what you can expect from the CD. Stay tuned for these and let us know what you think when you hear them…we hope you will be as excited about the finished disc as we are! What it was like recording our debut CD! 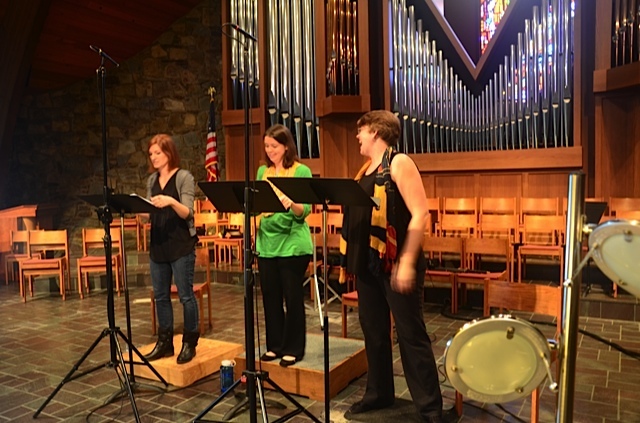 Three of the five AC members share their thoughts on what it was like to record their debut CD, and talk about the concert in Maryland last week. Armonia Celeste really packed in a huge workload during our visit to Cumberland, Maryland. We spent a day of rehearsal “remembering” our old repertoire and polishing some new additions to the CD we were about to record. 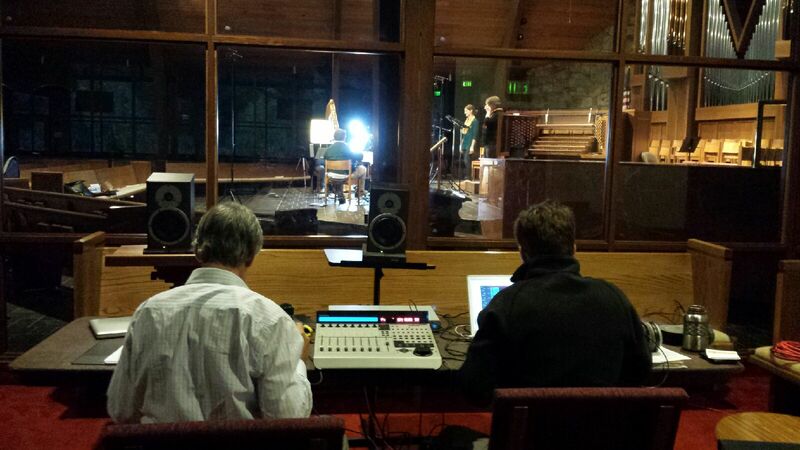 Then it was off to St. Paul’s Lutheran Church to spend three days recording. The people of St. Paul’s were so generous and welcoming in letting us use their beautiful space! Check out the photos! We were very fortunate to have two consummate professionals spearheading the recording project: Malcolm Bruno, our producer, came by plane, train, and automobile all the way from Wales (yes, as in the U.K.); Paul Vazquez, our recording engineer, made the drive from the NYC area. We marveled at the flattering sound they captured of the ensemble. Malcolm in particular is a genius in charmingly and diplomatically keeping our fatiguing selves moving smoothly forward on track, all the while helping us to find our best music-making. 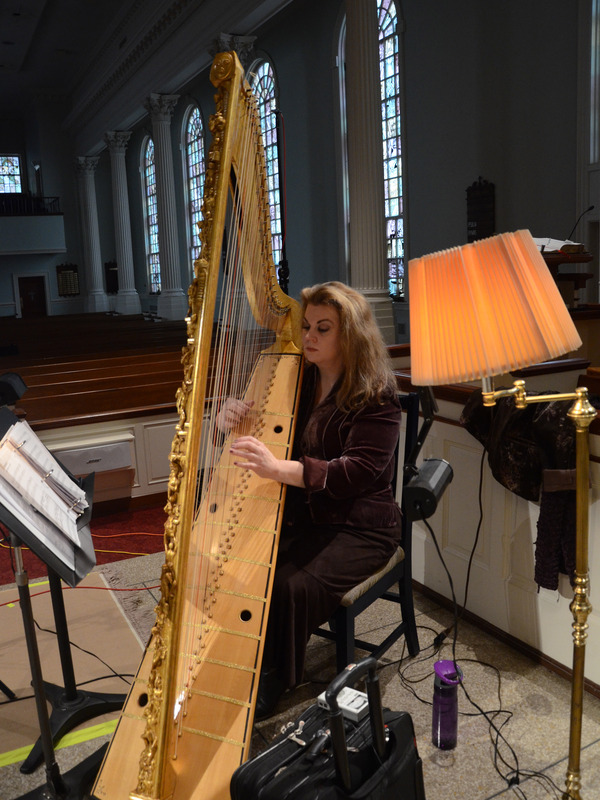 While it was some of the hardest work I’ve ever done (very long and intense days with few breaks, at maximum concentration, and all while propping up a very heavy huge Barberini harp—O, my aching back! ), it was also some of the most rewarding work…and we said goodbye to Paul and Malcolm feeling the camaraderie that comes of having forged something special together. But no rest for the weary! 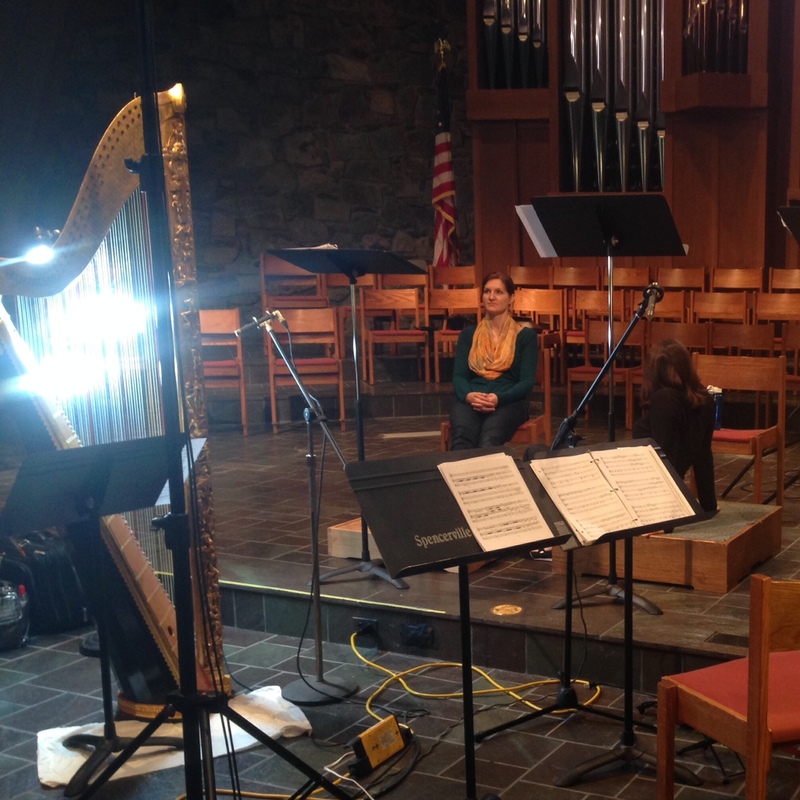 We went from the super-intensity of recording to immediately preparing for our weekend concert with Mountainside Baroque. A last-minute substitution of the very game and sweet-voiced Josh Ruppenkamp as our tenor made everything fall into place. The church was nearly filled by a fabulously receptive audience. The program of sacred music was by turns powerful and joyful and spiritual…audience members (and your very own correspondent) reported getting chills at points during the music-making! 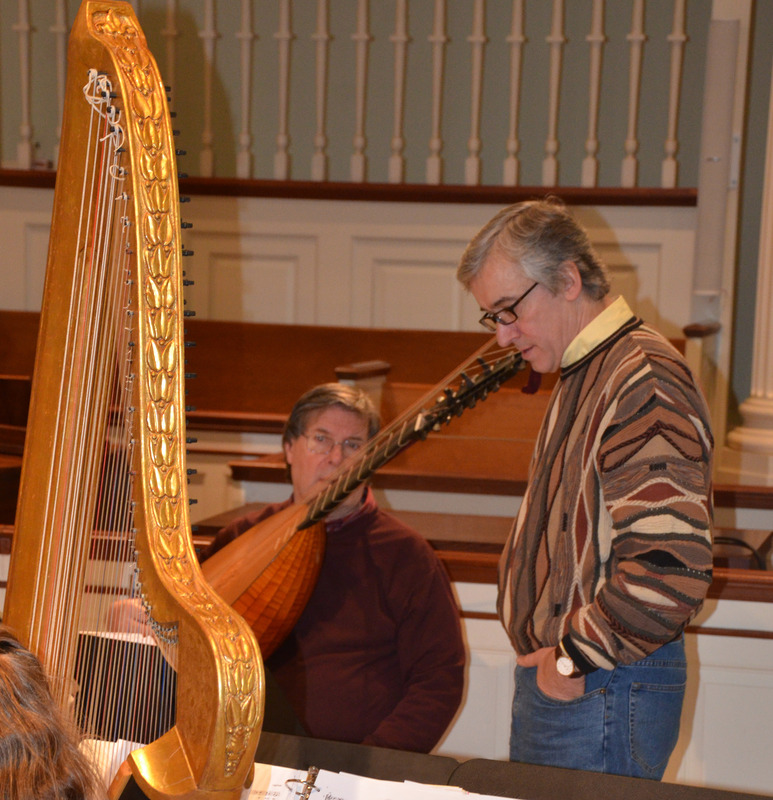 Our final chorus of “Plorate filii Israel” in Carissimi’s oratorio Jephte almost brought even the harpist to tears. 🙂 A wonderful conclusion to an astonishing week. Sarah: Still Riding High after Armonia Celeste’s Week in Maryland! What an amazing week in Maryland! I feel so uplifted by the music, the musicians, and the personalities we had the opportunity to work with, both in the three days of recording with Malcolm Bruno and Paul Vazquez, and in the concert with Mountainside Baroque where Armonia Celeste was joined by Ryan Mullaney, Josh Ruppenkamp, Les Anders, Pat Nordstrom, and Eric Kitchen. I expected to feel a bit of a letdown after such an amazing week, but upon my return to Texas this week, I found many friends and colleagues (especially at Preston Hollow Presbyterian and Southeastern Oklahoma State University) anxious and excited to hear all about our week of recording and concerts. It is nice to be reminded that our fan base is so strong here in Texas, even when we are off performing in other parts of the country! I already have a list of people anxiously awaiting the release of the CD. Now, even as I begin a new semester of teaching, I still have the music from last week following me from one task to the next. At turns haunting and amusing, achingly beautiful and furious, there seems to be something to accompany my every mood! I feel so blessed to have had this time, sharing amazing music with wonderful friends and colleagues, and I look forward to our upcoming concerts in June and beyond! Our first CD finally underway! We’re off to record our first CD, tentatively entitled “Udite Amanti–Lovers, Beware! 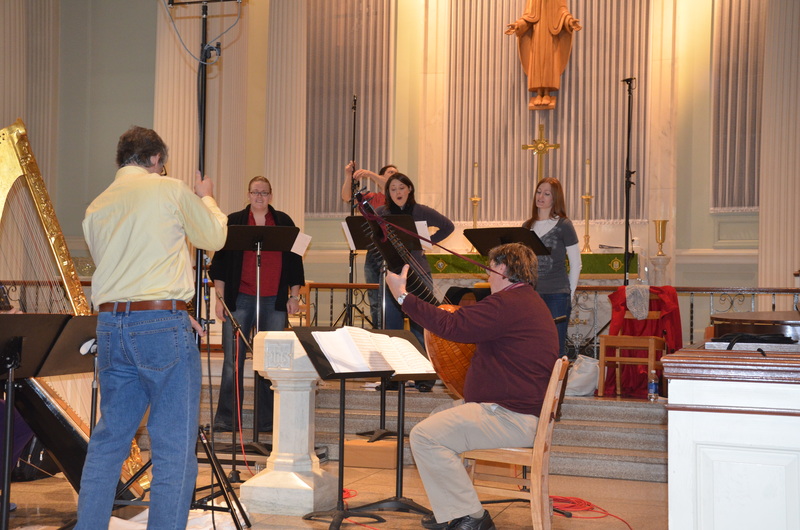 : Music from the Seventeenth-Century Barberini Court.” This is the program that nearly won us the 2011 Early Music America/Naxos recording competition and which has been enthusiastically received with standing ovations everywhere we’ve played it–featuring emotional and exciting music by composers associated with the powerful Barberini family of Rome, including Carissimi, Marazzoli, and Rossi. Armonia Celeste is thrilled to be working with the talented and experienced producer Malcolm Bruno on this recording, and we are confident and excited that we will have a very beautiful disc for your enjoyment later this year! 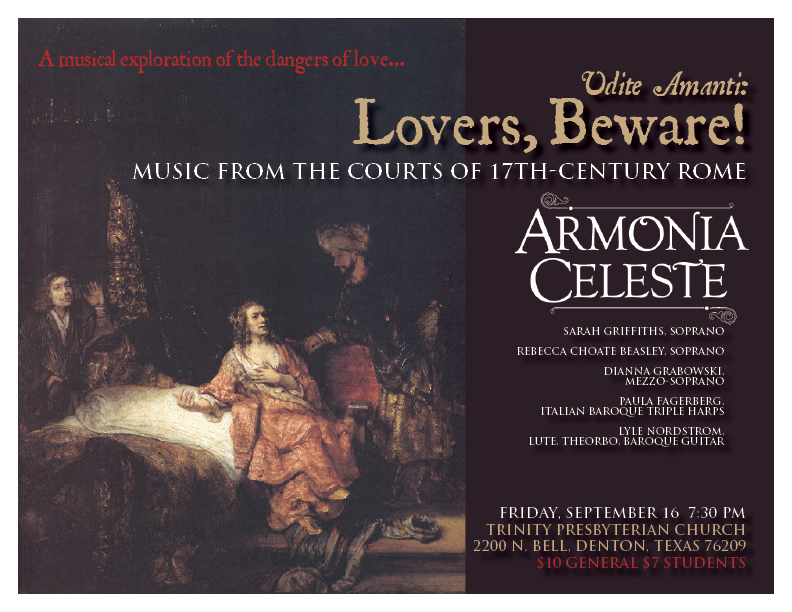 Next week (September 15-18) Armonia Celeste is undertaking a concert tour of Texas! The program, “Udite Amanti–Lovers, Beware! Music from the Courts of 17th-Century Rome,” features some rare muscological gems performed with the ensemble’s signature verve. With a theme charting the perils and folly of the heart, the music for the program comes from composers under the patronage of the powerful Barberini family, or who were heard at the Barberini court during the mid-1600s, especially Luigi Rossi and Giacomo Carissimi (who in 1688, along with Antonio Cesti, were named by G.A. Perti as “the three greatest lights of our profession”). Other composers on the program include Girolamo Frescobaldi, Antonio Francesco Tenaglia, Marco Marazzoli, and Marc’Antonio Pasqualini (one of the Barbarini castrati). There is an especial tie-in with the harp in this program. 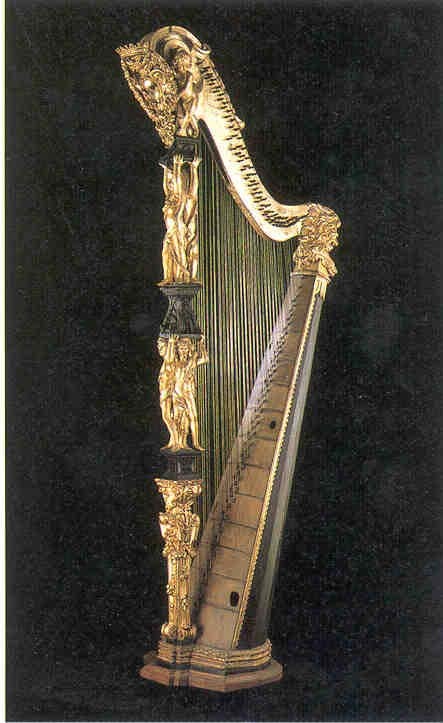 Perhaps the most famous surviving harp from the Baroque era is the Barberini harp (pictured above), which was played by Marazzoli. Costanza de Ponte, the wife of Luigi Rossi, one of the project’s featured composers, was a famous harpist of the time as well. For some of the first instances in centuries, Paula will play their music on her baroque harps during these performances. Lyle will also provide additional exciting rhythmic continuo on baroque guitar, on the plangent theorbo, and the charming lute, while the beautiful voices of Sarah, Rebecca, and Dianna will entwine in exquisite harmony above it all, in trios, duets, and solos–lamenting, exulting, and despairing over the ravishments and embattlements of love. Don’t miss this opportunity to hear the ensemble perform this program live near you! Armonia Celeste and this program are currently finalists in the prestigious Naxos/Early Music America recording competition–if AC wins, you will eventually be able to purchase a recording of this program on the Naxos label! For more information, please see our website: http://www.armoniaceleste.com. Please be sure to come and say hello after the concert! Click on the photo below to visit our website--hear sound samples, see our concert calendar, and learn all about us! Enter your email address to subscribe to this blog and receive notifications of new posts by email. Of course we will never share your info! September concert tour of the Midwest!